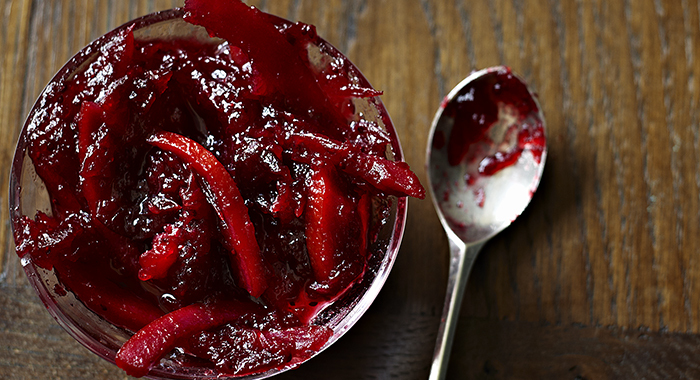 If you are having to make do with shop bought cranberry sauce this Thanksgiving then plan ahead for next year and make this delicious twist on the original, Cranberry & Orange Sauce, perfect as an accompaniment to your roast turkey, you can even stir a spoonful into your gravy for extra colour and flavour. 1. Halve the oranges and squeeze out the juice and pips. Slice the orange peel with its pith into thin shreds, about 4cm/1½in long. 2. Put the peel, orange juice and 1l/35fl oz/4 cups water into a large, heavy-based saucepan and slowly bring to the boil. Reduce the heat and simmer gently for about 30 minutes until the peel is really soft and the liquid reduced by about a third. 3. Meanwhile, sterilize enough small, wide-necked jars in the oven so that they are ready to use. 4. Add the cranberries to the pan, return to the boil, reduce the heat and simmer for 10–15 minutes until soft and the skins burst. 5. Reduce the heat, add the sugar to the pan and stir until completely dissolved. Return to the boil and boil for 3 minutes. 6. Spoon the sauce into the warmed, sterilized jars and cover immediately with a waxed disc and a dampened cellophane round or a lid. Label and store in a cool, dry, dark place. 7. Leave to mature for at least 2 weeks before using. Refrigerate after opening. A tip from Emma: If you don’t have fresh cranberries you can use frozen instead. It is not necessary to thaw them before use. If you like ginger, you could grate a small piece of root ginger and add with the cranberries. 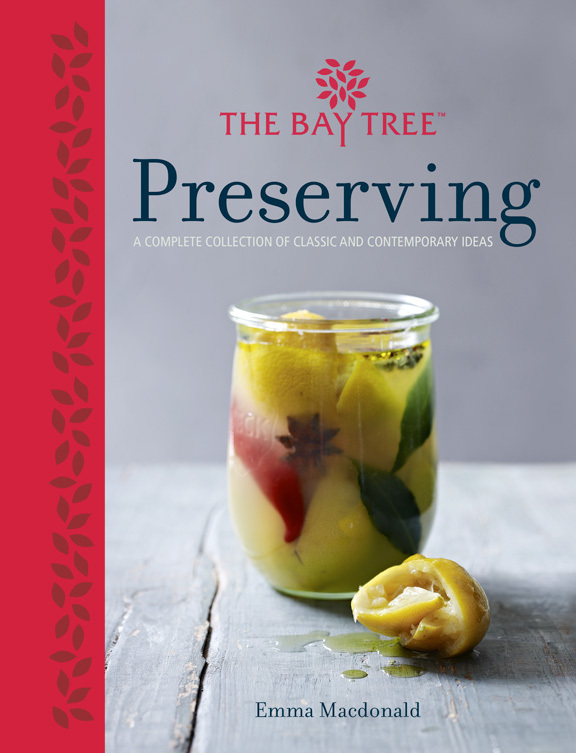 If you’re looking make the most of your produce or try your hand at making jellies, marmalades, curds and more Emma Macdonald’s Preserving is the only book you’ll need. From Daniel Galmiche Revolutionary French Cooking. The brilliant Daniel Galmiche graced the stage at the Ideal Home Show at Christmas this weekend and impressed the crowds with his delicious Swede and Butternut Squash Soup with Caramelized Chestnuts from his latest book, Revolutionary French Cooking. 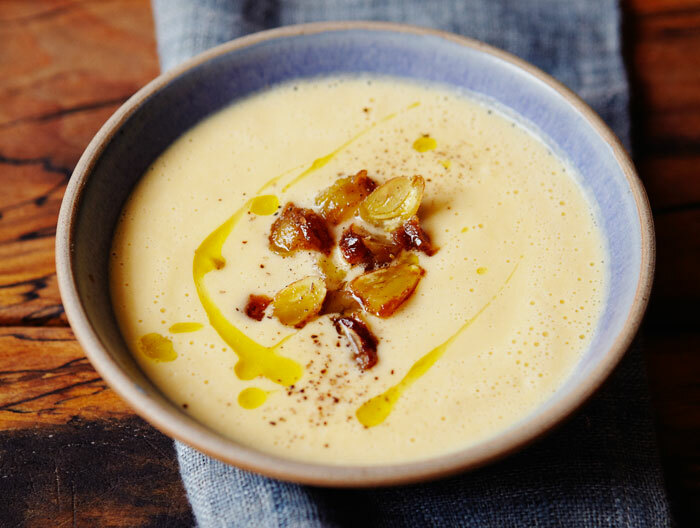 If you’re stuck for starter ideas to kick off the Christmas feast, there’s nothing like chestnuts to get you in the festive mood – and they go brilliantly with this warming winter soup. 1. Preheat the oven to 200°C/400°F/gas 6. Put the swede in a roasting tray, drizzle over the olive oil and season with a little salt and pepper. Roast for 5 minutes, then add the squash, stir to coat in the oil, then continue to roast for a further 7–10 minutes until they are just beginning to colour around the edges but are not cooked through. Remove from the tray and drain on kitchen paper. 2. Meanwhile, heat a large saucepan over a medium heat. Add half the butter and the onion and cook for 3–4 minutes until just softened but not coloured. Add the roasted swede and squash to the pan and toss together, then pour in the stock, cream and milk and bring to a simmer. Turn the heat down to low and simmer gently for about 30 minutes, uncovered, until the vegetables are very soft. The soup must not boil or the cream will curdle. 3. While the soup is cooking, make the caramelized chestnuts. Heat a non-stick frying pan over a medium heat. Add the remaining butter and when foaming, add the chestnuts and sugar. Cook for 3–4 minutes, turning once, until the chestnuts start to caramelize but take care they don’t burn. Tip the chestnuts onto baking paper and leave to cool and become crisp, then roughly slice them. 4. When the soup is ready, ladle it into a blender and blend until very smooth (you may have to do this in batches depending on the size of your blender), then pass it through a fine sieve into the cleaned saucepan; it should be very creamy and velvety. Season with salt and pepper to taste and warm the soup through. If you feel it is a little thick, add some more stock. Serve drizzled with extra virgin olive oil and topped with the caramelized chestnuts. 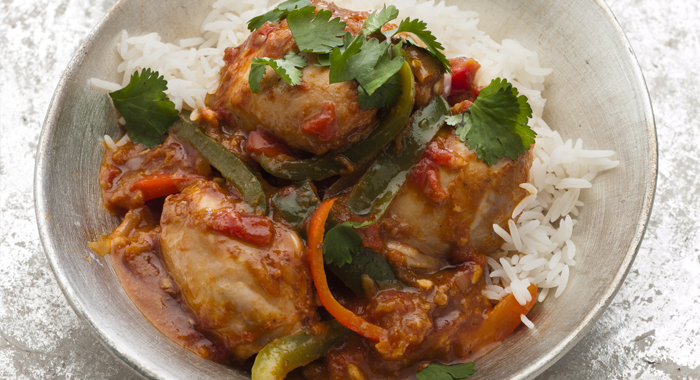 Don’t reach for the takeaway menu this Saturday night, instead get out your slow cooker and whip up this delicious Chicken Jalfrezi from Beverley LeBlanc. Beverley’s top tip for this one is to make double the quantity of curry paste and freeze the extra, then the next time you want to make this curry you can do so even quicker. 1. Put the chicken in the slow cooker. Melt the ghee in a large frying pan over a high heat. Reduce the heat to medium, add the peppers, chilli and onion and fry, stirring, for 6–8 minutes until the onion is softened and just starting to brown. Stir in the jalfrezi paste and fry for a further 1 minute. 2. Add the chopped tomatoes and season with salt and pepper. Bring to the boil, stirring, then pour the mixture into the cooker. 3. Cover the cooker with the lid. Cook on HIGH for 2 hours until the juices from the chicken run clear when the thickest part of the meat is pierced with the tip of a sharp knife or skewer. 4. Add a little more salt and pepper, if you like, and sprinkle over the garam masala. Sprinkle with coriander and serve with Cucumber and Mint Raita, rice and naan breads. 1. Put the garlic and ginger in a mini food processor and process until a coarse paste forms. Add all of the remaining ingredients and process again, scraping down the side of the bowl as necessary, until blended. 2. If not using immediately, refrigerate in an airtight container for up to 1 week, or freeze for up to 1 month. If you’re looking for more delicious slow cooker recipes Beverley LeBlanc’s I Love My Slow Cooker is a must have for your kitchen. If you want to know more about traditional approaches to treating common ailments, read Sarah Merson’s Top 100 Traditional Remedies. 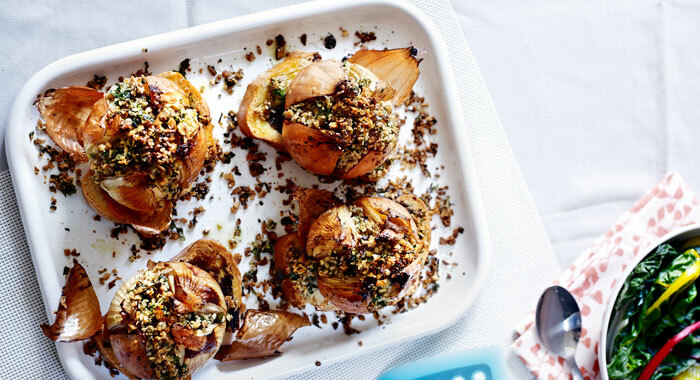 This week’s vegan recipe for World Vegan Month is for delicious roasted onions stuffed with toasted nuts and seeds, from Nicola Graimes’ brilliant Veggienomics. Here, the most humble of ingredients are turned into something special with very little effort. The baked onions are perfect served simply with steamed rainbow chard. 1. Preheat the oven to 180°C/350°F/Gas 4. Trim the root end of each onion so it stands up and then slice a cross into the top, cutting about halfway down. Remove any loose skin from the onions, put each one on a slice of bread and transfer to a small baking tin. Spoon a quarter of the oil and the balsamic vinegar over the top of each onion and season with salt and pepper. Cover the dish with foil and bake for 60 minutes, or until the centre of the onions are tender when prodded with a skewer. 2. Meanwhile, make the stuffing. Coarsely grind the toasted almonds and sunflower seeds in a mini food processor. Tip them into a bowl and mix in the rest of the stuffing ingredients with the remaining oil, and season with salt and pepper. 3. Remove the onions from the oven. Take off the foil, carefully open up the onions slightly and divide the stuffing mixture among them, spooning it into the centre of each one. Return to the oven, uncovered, and roast for another 15 minutes until the stuffing has heated through and is slightly crisp on top. Serve the onions on their slice of cooked bread with the rainbow chard on the side. 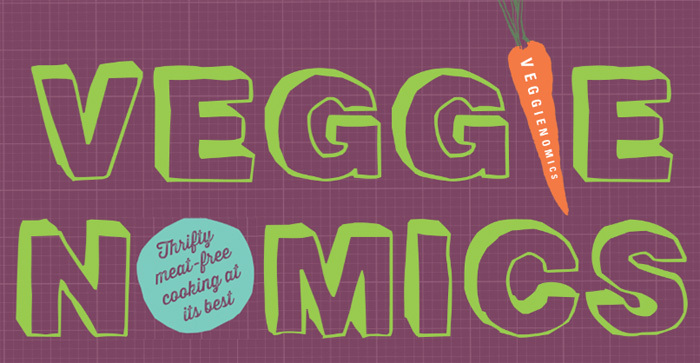 Looking for cheap, delicious and healthy vegetarian cooking? Then try the world of Veggienomics. 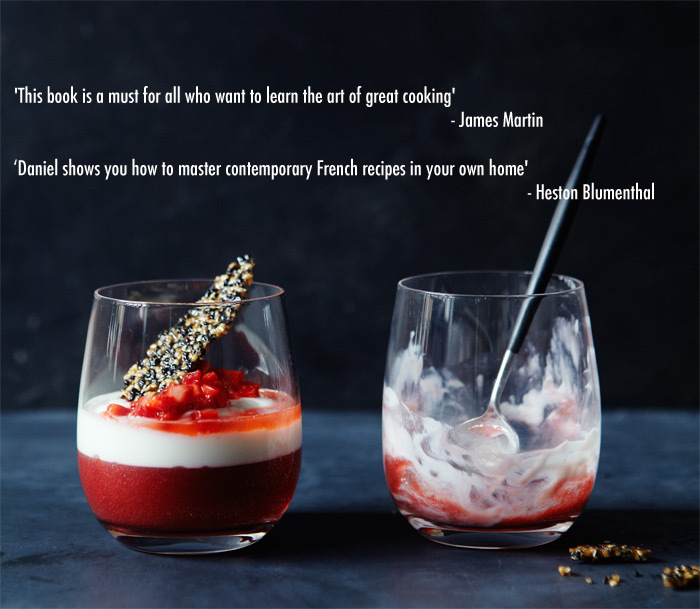 Click to find out how this cookbook can help you cut down your shopping bill! Reducing your intake of rapidly-digested carbohydrates can stabilize blood glucose levels, lower levels of unhealthy blood fat and improve sensitivity to any insulin still produced by your pancreas. Cutting down on salt reduces the sodium and fluid retention that can trigger high blood pressure. A high-fibre diet slows the absorption of dietary carbohydrates and cholesterol to improve your glucose control and blood cholesterol balance. Reducing energy intake helps you lose weight. Cutting back on partially hydrogenated trans fats can lower the risk of heart disease. Increasing your intake of healthy fats can improve glucose control and protect against cardiovascular problems. Fresh fruit and vegetables provide antioxidants and isoflavone that help to protect against the circulatory damage linked with diabetes. A wholefood diet provides trace elements that can improve glucose control. 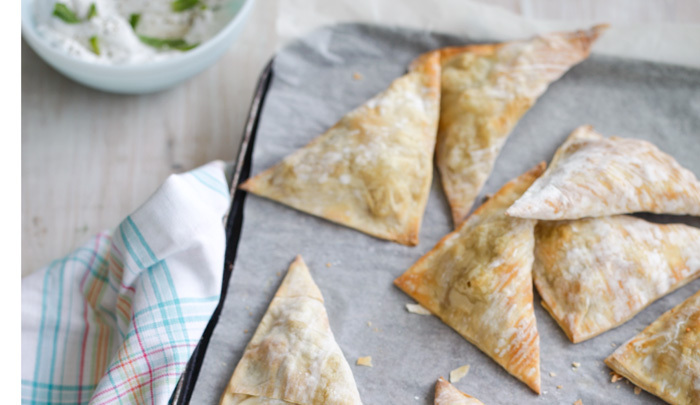 To continue our celebration of World Vegan Month, this week we are sharing a recipe for delicious vegan Potato and Coconut Samosas from Adele McConnell’s The Vegan Cookbook. They make a lovely and satisfying snack, and are great served with the tomato relish from last week’s Sweet Potato Hash recipe. 1. Preheat the oven to 180°C/350°F/Gas 4 and line a baking sheet with baking parchment. Put the cashew nuts into a blender or food processor and grind into a powder. Leave to one side. 2. Heat the oil in a large non-stick frying pan over a medium heat, add the onion, ginger and potatoes, and cook for 10 minutes, stirring constantly, or until tender. 3. Stir in the cumin, ground coriander, cashew nuts, desiccated coconut, coconut cream and coriander leaves, then cook for a further 5 minutes. Season with salt and pepper, then leave to one side to cool. 4. Lay the filo pastry sheets on a clean surface, and brush lightly with the oil. Lay one filo sheet on top of another and repeat with the remaining sheets to make 4 piles of double-layered filo. Cut each pile into four. Put 4 tablespoonfuls of the mixture into the centre of each square, then brush the edges of the pastry with water. 5. Fold each square into a triangle, then use your fingers to press the edges together. Transfer to the prepared baking sheet. Brush lightly with oil, and bake for 15 minutes, or until golden. Serve with your chosen accompaniment. Mussels are one of those foods that we really should be eating more of. Completely sustainable, and therefore much better for the environment, they are also a much cheaper protein source than most meat or fish. Not to mention the fact that they taste great and are season right now. 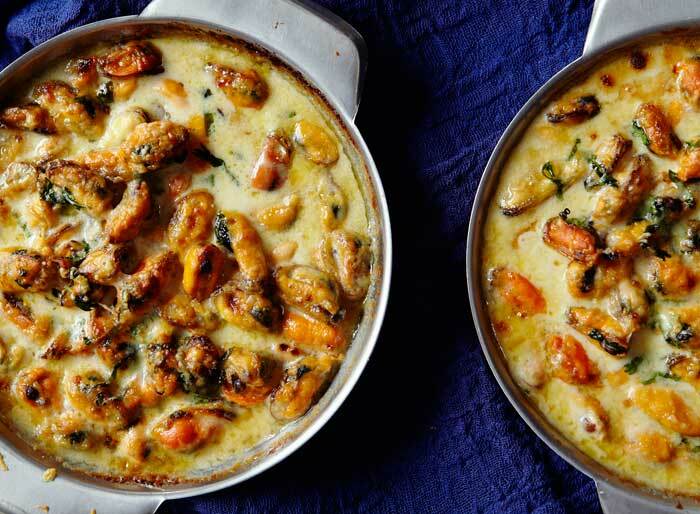 Moules marinière is the classic way to cook them – and a very good way at that – but mussels in a gratin with a creamy, aromatic sauce flavoured with lemongrass, ginger and fresh coriander is rather delicious, too. Mussels are easy to cook, just make sure that they are very fresh and throw away any with broken shells before cooking and those that don’t open once cooked. Don’t forget a fresh baguette or homemade chips to dip into the sauce – it wouldn’t be the same without them! 1. Thoroughly scrub the mussels under cold running water and rinse well. Remove the beards by pulling them towards the large part of the shell. If any of the mussels are open, tap them hard against a work surface and if they don’t close, discard them. 2. Generously butter four flameproof 18cm/7in gratin dishes. Heat a large, deep saucepan over a medium heat. Add the oil, shallot, lemongrass and ginger and fry for 2–3 minutes until just softened but not coloured. Turn the heat up to high, add the wine and cook until reduced by one-third, allowing the alcohol to evaporate. Add the mussels and half the coriander leaves, cover with a lid and cook for about 5 minutes at the very most, shaking the pan occasionally, until the mussels have opened. Discard any that remain closed. Remove from the heat and scoop all the mussels into a colander using a slotted spoon. Leave to cool slightly before shelling them. Discard the shells. 3. Spoon the shelled mussels into the prepared gratin dishes and put on a grill tray. Strain the juices from the pan and bowl through a fine sieve into a measuring jug. Reserve 200ml/7fl oz/scant 1 cup of the liquid. 4. Preheat the grill to high. Pour the mussel liquid into a sauté pan and add the stock and cream. Put over a low heat and bring almost to the boil, then simmer for about 5 minutes until reduced by half and thickened enough to coat the back of a wooden spoon. Season with pepper to taste and a little salt, if necessary. 5. Ladle the cream sauce over the mussels in the gratin dishes. Sprinkle the remaining coriander on top, then finish with a sprinkling of cheese, making sure the cheese covers the coriander so that it doesn’t discolour. Put under the hot grill for a minute or so until bubbling and golden brown. Serve hot. From Roz Denny’s The Big Book of Great British Recipes. 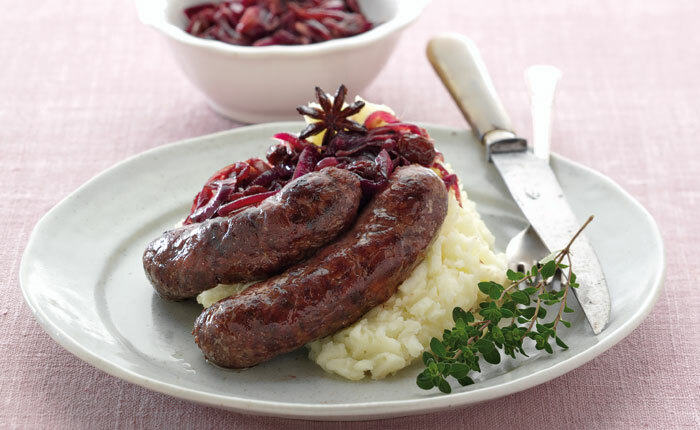 Bangers and mash has to be the perfect bonfire night feast. But at Nourish we like to give things a bit of a healthier twist. Switching pork sausages for leaner venison ones is a great way to cut down on some fat. The red onion marmalade accompanies the venison perfectly and, warmly spiced with cinnamon and star anise, it makes a great change to gravy. 1. Cook the onions and garlic in just enough oil to cover over a low heat for a good 20–30 minutes until reduced down and soft but not browned. 2. Add the spices and cook for 1 minute, then stir in the vinegar and cook until reduced, followed by the raisins and horseradish. Season and set aside. 3. Grill or pan-fry the sausages for a total of 15 minutes until just firm and still a little juicy. Stand for 5 minutes before serving with the onion marmalade and some creamy mashed potatoes. Garnish with sprigs of thyme, if you like. 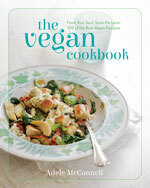 To celebrate World Vegan Month, each Monday we will be sharing a brilliant vegan recipe to add to your repertoire. For this first week it’s all about happy beginnings, so get your day off to a good start with this delicious vegan brunch. You can make the relish beforehand and keep it in the fridge for up to 4 weeks. The versatile hash mixture can also be made into burgers or a rosti – simply soak 1 tablespoon chia seeds in 3 tablespoons water for 10 minutes, then stir into the cooked hash. Form into burger shapes and fry in a little oil for 5 minutes. 1. To make the relish, put all the ingredients in a large, heavy-based saucepan. Bring to a gentle boil over a medium heat, then reduce the heat to a low simmer and cook for 45 minutes, stirring frequently, or until the pepper is soft and the liquid has reduced. Adjust the seasoning to taste. 2. When the relish has thickened, remove the pan from the heat and leave to cool. 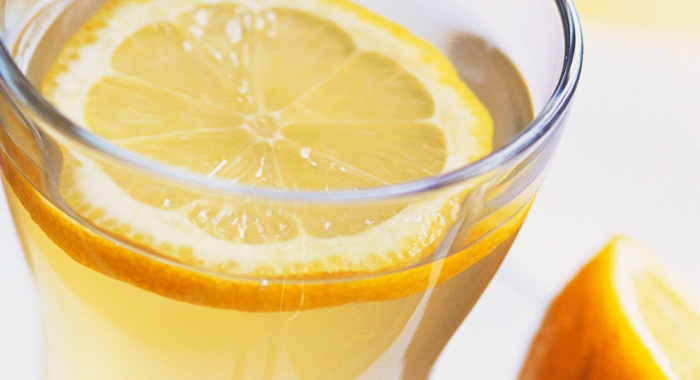 Pour into a sterilized glass jar and store in the fridge for up to 4 weeks. 3. 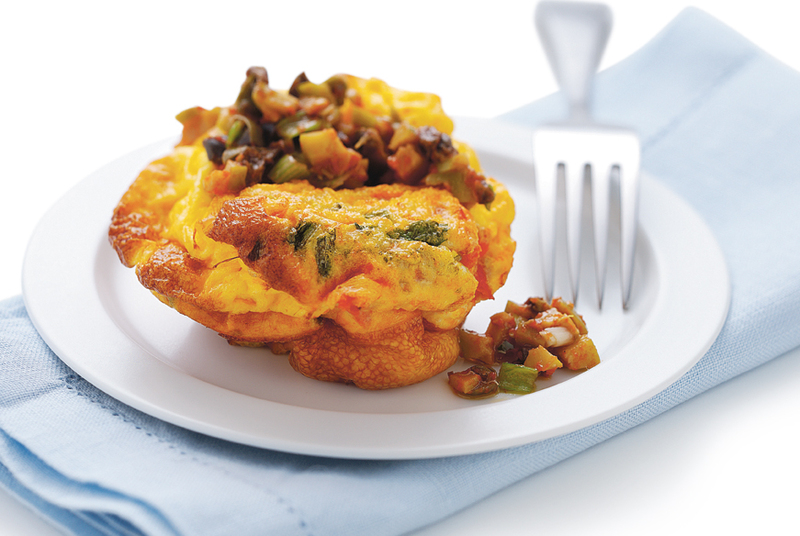 To make the hash, heat the oil in a heavy-based frying pan over a medium heat and add the sweet potato and onion. Season with salt and pepper. 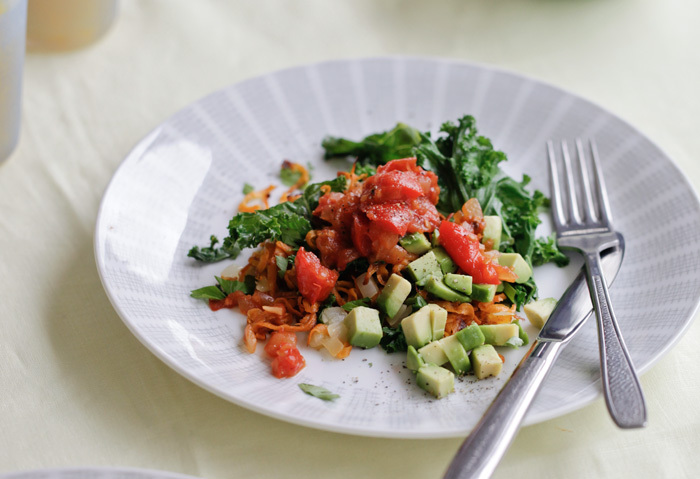 Cook for 10 minutes, stirring frequently, then add the kale and cook for a further 10 minutes, or until the sweet potato is crispy and the onion is soft. Drizzle over the lemon juice and sprinkle with parsley. Serve with diced avocado, and top with a large spoonful of tomato relish.